This post contains affiliate links. By clicking on links and making a purchase through said links we will be compensated. All thoughts and opinions are our own. Hello, lovelies! The air is getting chillier and Christmas decor is starting to show up in all the storefronts here in town. I made me excited to start working on my first gift guide for the season. I no longer have a little baby in our house, but I do have two sweet babies in my life with the addition of my niece and my nephew. I had a blast putting this little wishlist together as I thought about them. I definitely am feeling all the holiday cheer and Christmas spirit! I am fighting the urge to put our tree. I know my husband would flip a gasket if I did it now. *insert laughter here* And to be honest, I am a little behind on my shopping this year. Yikes. How about you? 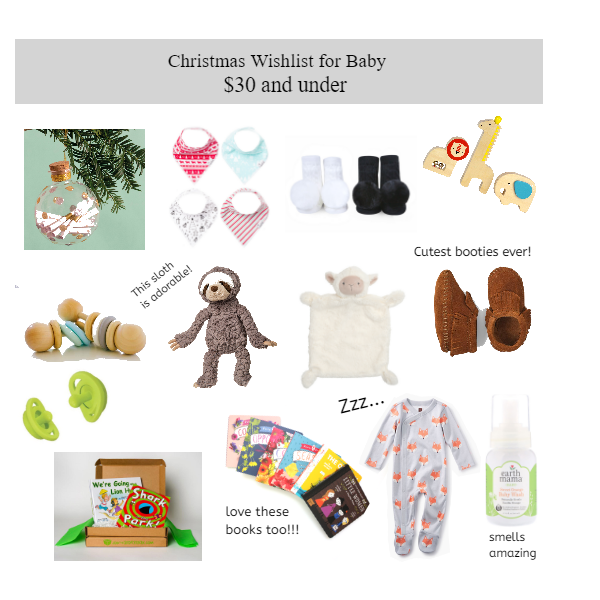 I hope this wishlist will inspire you to shop. I personally love shopping for babies. They have all the cute stuff. Oh, and bonus--I love that all the items on this wishlist are $30 and under! I am a fan of books. My daughter has a nice little collection of Baby Lit books. Her favorites are Peter Pan and The Nutcracker. We also just subscribed to The Story Box. If you use my code TAKESIX you get $6 off your first order. The Board Books box contains two new books a month, only $14.99, and would make a great gift for a baby or toddler. Sweet Orange Baby Wash *Smells Amazing BTW! Still use this on my kids.